When going on a hiking trip, you need a backpack that is durable, comfortable, and able to carry all your possessions. 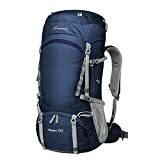 Choosing the best backpacking backpack can be challenging, as there are several brands and models to choose from, each with unique features and price tags. If you need quality, durability, and easy access, look no further than the TETON Sports Scout 3400, a high-performance backpack with an internal frame, multi-position torso adjustability, and ergonomic straps. The TETON Sports Scout 3400 is one of the best-selling backpacks today. If quality, comfort, and complete versatility is essential to you, keep reading to learn more about this model. One of the most prominent features of this backpack is that it can be adjusted to fit your specific body type. The TETON offers complete adjustability around the shoulders, waist, torso, and chest. The backpack’s torso length can be adjusted from 15” to 19.5” to fit almost all youths and adults perfectly. Comfort is crucial when you are traveling long distances on foot. The Scout 3400 have several high-end comfort features to make your trip enjoyable, including padded shoulder straps with top load adjustment, a cushioned and ergonomic hip belt with locking straps, and a padded back panel that are channeled for air flow to reduce heat and moisture build-up. While hiking, you may be exposed to harsh elements. The Scout 3400 backpack features secure storage solutions to ensure that your belongings are safe, even in severe weather. These features include an integrated rainfly, a shell that is made of 600D Ripstop and 600D Oxford canvas, and weather-guard zippers. The backpack also offers ample carrying ability with a capacity of 3,400 cubic inches (55 liters) and compression straps for securing items to your backpack. Because of its size and comfort, it is the best backpacking backpack for short trips. Hikers are familiar with the hassle of retrieving a single item from their back when they need it. TETON Sports solves this problem with several accessibility features, including gear loops for storing long items, quick-access pockets, a separate sleeping bag compartment, hydration bladder, and multiple compartments that allow you to pack strategically. Why A Backpack vs. Standard Rolling Luggage? 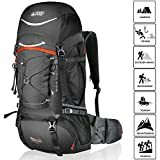 One of the prominent advantages of backpacks over rolling luggage is that, unlike rolling luggage, they free up your hands to present travel documentation, draw money at an ATM, or book tickets for public transportation. Rolling luggage is only comfortable if you are walking on smooth airport floors. On rugged terrain like cobbled streets, however, you need a backpack. Generally speaking, backpacks are more versatile than standard rolling luggage. In addition to air travel, backpacks are also suitable for day hikes and other outdoor adventures. The best travel backpack typically also offers better moisture protection to your belongings than rolling luggage. Backpacks typically feature external pockets and compartments that makes accessing your belongings easy and quick. If you have to retrieve an item, for example, a coat from your rolling luggage, you will have to find a convenient location, open your luggage, rummage around, remove the item, and reorganize the content of your luggage before closing it. Buying a Backpack – What is Important? Your backpack should fit you perfectly to prevent discomfort and sore muscles. The most important measurement is your torso, which is the length between the base of your neck and the small of your back. Adjustable backpacks are ideal if you are still growing. Since you want your backpack to last for many years, pay attention to quality. Tell-tale indications of poor quality include careless stitching, loose threads, torn fabric, and poor reviews. Sturdy shell materials like Cuben Fiber is ideal. The best backpacks have extra features to make your life easier, including belt pockets, compression straps, and compartments for gear like tents, sleeping bags, and carabiners. Consider these features when shopping for a new backpack. Protection is a primary function of your backpack. Select a backpack with a durable, high-quality shell and waterproofing features. Zippers should ideally also be waterproof, especially in hiking backpacks. One short rainstorm can ruin an entire trip once your gear is soaked. The best travel backpack may differ slightly from a hiking backpack. If you are planning on using your backpack in urban areas, you will need features like specialized storage for your laptop and travel documentation. If, on the other hand, you need a backpack for outdoor hiking, consider features like waterproofing, aluminum stays, and a sternum strap. Proper ventilation will also help keep your back cool. How do You Properly Pack a Hiking Backpack? Proper packing is crucial to prevent the backpack from shifting or swaying as you hike. Efficient packing will also ensure that the backpack’s weight is balanced on your hips. Your backpack can be divided into three parts, namely the top zone, core zone, and the bottom zone. All bulky items and camping gear like sleeping pads, thermal underwear, and sleeping bag should go into the bottom compartments. Pack all heavy and dense items like your cooking kit and food stash in the core zone. Bulky items you need while hiking should go in the top zone to allow for easy access. Use the exterior pockets for small items you may need while hiking, for example, your water bottle, first aid kit, and snacks. Gear-loops are ideal for storing long items that don’t fit in your backpack. There are several general packing tips to keep in mind. Packing in rows instead of columns will prevent uneven horizontal weight distribution. You should also tighten your compression straps to ensure that your backpack is a compact as possible and that items are not rolling around loosely, as it can compromise your comfort while hiking. A swaying backpack will act as a wrecking ball. If it swings too much, it can even knock you off balance! This type of hiking backpack features a supportive frame that allows it to stand upright when it is empty. Frames are typically made from lightweight materials like aluminum. This style of backpack is suitable if you require stability, easy organization, and comfortable hiking on uneven terrain. Framed backpacks are typically heavier than frameless backpacks, so if a lightweight is one of your key considerations, select a frameless pack. Frameless backpacks are great for small loads and active outdoor activities. Since these backpacks collapse when they are empty, they are easier to store and transport than framed backpacks. They also work well when traveling since you can cram them into overhead bins or cargo areas. Backpacking backpacks are designed for people who go on month-long overseas trips. A backpacking backpack can have a carrying capacity of up to 6,000 cubic inches and typically has a range of features for added comfort, including a harness, padding, channels for air flow, and hip straps for added support. TSA-friendly backpacks are designed for comfortable air travel and feature laptop compartments that are accessible to TSA checkpoint scanners. They usually have less storage space but have convenient features to make air travel easier. How Big of a Backpack do You Need for Backpacking? There are three size ranges for backpacks. Carrying capacities smaller than 2,500 cubic inches are suitable for one-day use and can accommodate items like food, a first-aid kit, and one piece of clothing. Weekend backpacks typically have a capacity of 2,500 to 4,000 cubic inches and can hold items like sleeping bag, small tent, and clothes. Expedition backpacks are larger than 4,000 cubic inches and are ideal for carrying professional mountain gear. The MOUNTAINTOP is a popular, high-end nylon backpack that is available in three sizes: 55L, 75L, and 80L. This backpack checks all the requirements for overseas travel, camping, and hiking. It brings durability, comfort, and full length and shoulder strap adjustability with a super carry-CR adjustable weight distribution system. Standout features of the MOUNTAINTOP include attachments for trekking poles, high-quality YKK buckles for added durability, attachment points for camping gear, and S-shape shoulder straps to allow for a comfortable fit. A hip belt pocket makes smaller items like your phone, GPS, or snacks more accessible while you are hiking and there are side pockets for your water bottle. The MOUNTAINTOP is hydration system compatible and features a hydration sleeve in the main compartment. The backpack also has eight compression straps for tying up your pack and to prevent dangling. Fully Adjustable Hiking Backpack Backpanel. High Capacity but Lightweight and Comfortable. Tool Attachment Points and Multiple Pockets. The TERRA PEAK backpack is available in several sizes, namely 55L, 65L, 85L. It is suitable for a wide range of outdoor activities and traveling applications, including overseas backpacking, hiking, and camping. If you are looking for versatility, the TERRA PEAK may be perfect for your needs. High-value features of the backpack include a fully adjustable internal frame system, a sternum strap with a durable SBS buckle, and high-quality 3D mesh for additional storage. This backpack has a light weight, but since it features an aluminum stays and durable shell, it has a high weight bearing capacity for its size. One feature that reviewers found to be particularly valuable is the fully adjustable “Pro-Mech” back panel for added comfort and to reduce muscle fatigue. With this backpack, you can take all your gear with you. The TERRA PEAK has several attachment points and exterior pockets as well as eight compression straps, an elastic bungee cord system, and trekking pole attachment. The Venture Pal is one of the most popular options for day hiking and camping. It has a carrying capacity of 35 liters and is made from a durable and water-resistant nylon material. One of the Venture Pal’s most valuable features is its durability. The pack features a heavy-duty two-way zipper that is made of SBS metal as well as bar-tack reinforcement around the stress points. This backpack is also comfortable to wear. The padded shoulder straps are fully adjustable and made from breathable mesh. The pack is also fitted with a chest strap to ensure a snug and secure fit. Organizing your belongings is easy with the Venture Pal. There are several compartments, including two zipped front pockets and two side pockets. The main compartment is big enough for multiple sets of clothing, food, and water bottles. The Venture Pal is compact and lightweight. It has a double-layered bottom piece that reinforces the backpack, and that makes carrying heavy loads comfortable. Since it has no frame, it doesn’t take up much space in storage. When shopping for a new backpack, comfort and quality should be your crucial buying considerations. If you cannot adjust your backpack to fit your body type, you will be uncomfortable and in a good amount of pain. Your pack should also meet your individual needs and offer complete protection against harsh weather and temperatures. After reviewing our list of the best backpacks, you should find a pack that can keep up with your lifestyle. If you are still unsure, The TETON Sports Scout 3400 offers overall value as far as comfort, versatility, protection, carrying capacity, and easy access are concerned.